There are 6 Assisted Living Facilities in the Marshfield area, with 4 in Marshfield and 2 nearby. The average cost of assisted living in Marshfield is $4,246 per month. This is higher than the national median of $3,346. Cheaper nearby regions include Stratford with an average starting cost of $4,200. To help you with your search, browse the 16 reviews below for assisted living facilities in Marshfield. On average, consumers rate assisted living in Marshfield 3.7 out of 5 stars. Better rated regions include Stratford with an average rating of 5.0 out of 5 stars. Caring.com has helped thousands of families find high-quality senior care. To speak with one of our Family Advisors about assisted living options and costs in Marshfield, call (855) 863-8283. Located in the rural heart of Wisconsin, Marshfield is the second largest Midwestern town in Wood County with a lot of open space and numerous natural wildlife areas surrounding it. The small city has a number of art galleries and a regular concert series with performers from around the globe. 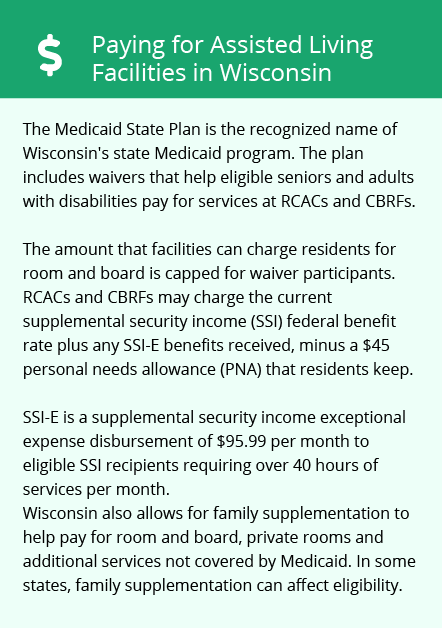 There are also six assisted living facilities in the Marshfield, Wisconsin area, all of which are regulated and licensed by the Wisconsin Department of Health Services. Marshfield temperatures fall to as low as 6 degrees Fahrenheit in the dead of winter, and it's common for them to stay below freezing regularly between November and March. Summers are warmer though, with temperatures that reach highs of 81 degrees Fahrenheit in July. On a scale of one to 100, with one being the worst, the air quality in Marshfield scored a 68. This is higher than the national air quality rating of 58. For seniors with respiratory problems, the city's better air quality might make it a lot easier to breathe. The overall average cost of living in Marshfield is lower than the state median and about 10 percent less than national averages. However, the average cost of necessities like groceries, health care services and utilities remain in-line with most U.S. cities. Marshfield's crime rate is higher than approximately 83 percent of the state's cities. However, it's on par with other similar-sized cities throughout the United States. Also, the violent crime rate is well below the national average, so seniors may find the area a relatively safe place to live. Wood County’s Elderly and Disabled Transportation Program gives rides to seniors over the age of 55 via the Marshfield Bus line and the Wisconsin Rapids Bus line for discounted rates. Also, door-to-door rides can be arranged by volunteers, who can drive seniors to medical appointments that are farther away. The Marshfield area is home to world-class medical facilities, including Marshfield Medical Center, in the event of medical emergencies or illness. Assisted Living costs in Marshfield start around $4,246 per month on average, while the nationwide average cost of assisted living is $4,000 per month, according to the latest figures from Genworth’s Cost of Care Survey. It’s important to note that assisted living rates in Marshfield and the surrounding suburbs can vary widely based on factors such as location, the level of care needed, apartment size and the types of amenities offered at each community. 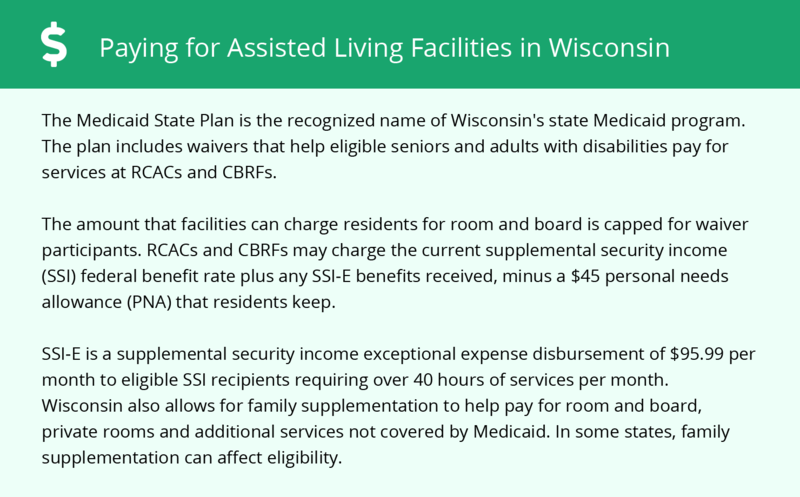 Wisconsin’s state Medicaid plan can help seniors who need financial assistance with their assisted living facility through PACE and SSI-E programs. Marshfield and the surrounding area are home to numerous government agencies and non-profit organizations offering help for seniors searching for or currently residing in an assisted living community. These organizations can also provide assistance in a number of other eldercare services such as geriatric care management, elder law advice, estate planning, finding home care and health and wellness programs. To see a list of free assisted living resources in Marshfield, please visit our Assisted Living in Wisconsin page. Marshfield-area assisted living communities must adhere to the comprehensive set of state laws and regulations that all assisted living communities in Wisconsin are required to follow. Visit our Assisted Living in Wisconsin page for more information about these laws.